I've been meaning to do a giveaway for quite some time now, but what with being out of London for uni placements, and the Christmas holidays, it's taken me a while to get myself organised. Still, better late than never and I hope you'll like the prizes I've chosen. - Leave me a comment below telling me what you are most looking forward to in 2012. 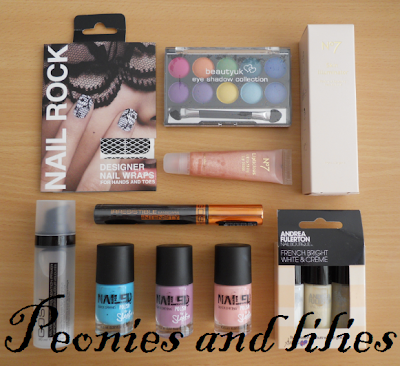 - For extra entries, simply tweet about the giveaway and/or like 'Peonies and lilies' on Facebook. and will end at 12am on 18th February 2012. I study Fine Art and I cannot wait to be able to say I have a degree, will make all the hard work worthwhile :) Only 13 weeks to go! Oooh such a lovely giveaway, you're too kind! I'm looking forward to getting my website launched :). Hello Fei! I'm looking forward to getting a proper job this year as I've finally graduated so it's quite an exciting yet anxious time especially during such economic times! i woult love to enter, im most looking forward too in 2012 is finding a new job that i actually love to do! i cannot wait to finish my masters in 2012! Great prizes!! I am most looking forward to moving to London! The Hunger Games Movie! I read all the books in about a week and have been patiently waiting for the movie since it was announced! My email is: theelizabeth95@gmail.com. I also liked your page on facebook. Thanks for the epic giveaway! i'm most looking forward to a fresh start and trying new things! I'm most looking forawrd to finally getting a job that I like.. I follow you via GFC as suzie. My email is livinpretty at gmail dot com. What gorgeous prizes. Thank you!! Thank you for the give away! I'm most looking forward to going to University! Eek! Hello!! For 2012 I'm loking forward to have a rolling contract in order to have a baby. Thanks a lot for this GA it's so generous!! Thanks for the giveaway! I am most excited to be graduating college in 2012! Ooo great set of prizes! In 2012 I'm most looking forward to spending time with my best friends after a crappy 2011. In 2012 I am most looking forward to getting settled into my new house and hoping my broken foot heals soon!!! Pretty much over it now!!! Retweeted your message about the giveaway, I am Beautyfromliz on twitter. In 2012, i'm looking forward to a brighter future. Passing all my subjects is a must. I'm looking forward to finishing my GCSE's! I'm most excited about growing my writing business in 2012! Enter me please! This new year, I'm looking forward to finish my career! My new job in 2012 of course! I'm most looking forwards to finally graduating and going out into the ig scary world! ... and the end of this cold weather! making more time to spend with my two beautiful daughters. following you on fb Gemkat Horrex and on twitter @gemkats. I'm looking forward to a music festival. Fab giveaway. I'm most looking forward to a holiday in the sun somewhere special in 2012.
following via GFC at éva. liked on facebook, my name starts with Natália A. B.
I am looking forward to my summer holiday! The sunshine - I'm bored of winter now. Thank you! I am most looking forward to losing some weight and getting a job this year! I need both! I'm most looking forward to getting through my first year of university! I'm looking forward to going to college in the fall. Im looking forward to home full of love and a life with more balance mentally and physically. In 2012 I 'm looking forward to go to the see with my little girl. I am most looking forward to starting my new degree! i will be looking forward to moving to london to study at London College of Fashion this september. I am looking forward to meeting my new little niece/nephew and welcoming them into the world!